I was fortunate enough to visit the Galapagos a few years ago, and I did see locally grown coffee for sale on San Cristobal while I was there. I don’t remember it making as big an impression on me as this Reserve coffee did, although I do remember being pretty satisfied (and surprisingly so, since when you travel coffee can be a crap shoot) with all the coffee I had. 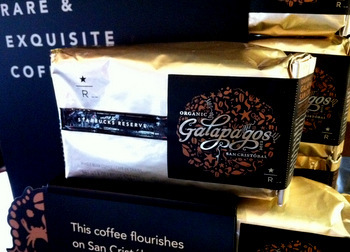 Needless to say, I was excited to see that Organic Galapagos San Cristobal was one of the newest Starbucks Reserve offerings this month. Galapagos has some very interesting microclimates and can be a great place for growing coffee, although you wouldn’t necessarily expect that to be the case. This coffee is produced in very small quantities by a single farm, Hacienda “El Cafetal.” It is a medium bodied coffee, with a wide range of interesting herbal notes to it and a very clean finish. I didn’t get as much citrus as I find in many other coffees from nearby regions, and that plus the herbaciousness of the coffee made it very unique. It is very refreshing and fantastic iced, although I definitely like it hot as well. This is probably one of my favorite Reserve coffees to date, and it is at a good price point (for such a rare coffee) that this is one I’m taking home with me and not just having from the Clover.